More people living near the Chemours chemical plant in southeastern North Carolina could qualify for alternate water supplies if the EPA’s initial findings on the toxicity of GenX, released last week, are finalized. A chronic reference dose is the daily amount of GenX a person can be exposed to for decades without suffering adverse health effects. A health goal is non-enforceable but is widely used by states and tribal nations to issue recommendations. North Carolina’s provisional health goal for GenX in drinking water is 140 ppt. In the Wilmington area, concentrations of GenX in drinking water are already below 110 ppt. 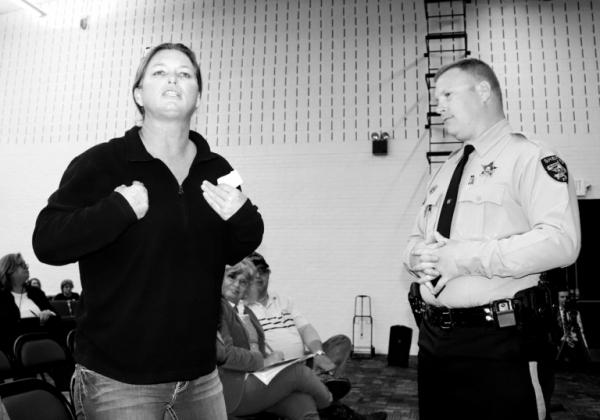 However, some people who live near the Chemours plant are on private wells that have tested between 110 ppt and 140 ppt. Those households could switch to bottled water, whole-house filters or connection to a public water system. Chemours would be responsible for the cost of installing or connecting those systems. The wells of 225 households in that area have already tested above 140 ppt. The plant is near the Cumberland-Bladen county line along NC Highway 87. A spinoff of DuPont, Chemours and its parent company have discharged GenX and other per- and poly-fluorinated compounds into the Cape Fear River, soil and groundwater — as well as emitted it into the air — for about 40 years. Those contaminants entered public drinking water supplies in New Hanover and Brunswick counties, and the private wells of dozens of residents living near the plant. Detlef Knappe, an NC State University professor and a leading scientist in the field of emerging contaminants, said the EPA’s reference dose for GenX is slightly more protective than the one used by North Carolina’s Department of Health and Human Services (DHHS). However, several factors can affect an individual’s total exposure to GenX: the person’s weight, the amount of water consumed per day, and the percentage of exposure that comes from drinking water. GenX is also found in non-stick coatings, such as Teflon, as well as pizza boxes, microwave popcorn bags and fast-food wrappers. A common estimate is that people receive 20 percent of their exposure to GenX via drinking water. Bottle-fed infants are particularly vulnerable because they drink a lot of water relative to their small body weight. DHHS based its calculations for a provisional health goal on the potential risks to that population. With the reference dose EPA proposed yesterday, the same assumptions would lead to a health goal of 110 ppt, Knappe said. The state Science Advisory Board has agreed with DHHS’s calculations and methodology. If the EPA’s draft findings stand, said Knappe, who is a member of the Science Advisory Board, “I would expect DHHS to lower the health goal” to 110 ppt. Animal studies have shown that GenX can harm the kidneys, blood, immune system, a developing fetus and the liver. Data, the EPA says, also suggest the chemical can cause cancer. Last week, NC State scientists Jane Hoppin, Nadine Kotlarz and Knappe released results of a study analyzing levels of about a dozen PFAs — per- and poly-fluorinated compounds — in the blood of 345 Wilmington residents, both children and adults. GenX was not detected but other new and known PFAs were: Nafion byproduct 2 (98 percent of residents sampled) PFO4DA (98 percent), and Hydro-EVE (76 percent). Some of these compounds haven’t been widely found elsewhere. Concentrations of PFOA, which has been phased out, but lingers in the environment, were higher in Wilmington residents’ blood than the national average: 4.4 parts per billion, compared with 1.5 ppb. Earlier this year, DHHS conducted a smaller study, sampling the blood of 30 adults living near the Chemours plant. GenX was not found, but all study participants had some level of PFHxS in their blood. It is often found in carpet and firefighting foam. Also detected in all blood samples were the compounds n-PFOA, n-PFOS, and Sm-PFOS — variations of C8, which is no longer being produced. Among those enrolled in the DHHS study, the highest level of n-PFOS was 34.6 parts per billion. In the general US population, it was 14 ppb. People who drank from wells near DuPont’s notorious plant in Parkersburg, WV, had median levels of 38 ppb. The EPA also issued a reference dose for PFBS, which can be found in drinking water, dust, carpet and carpet cleaners, floor wax, and food packaging. PFBS is “substantially less toxic” than PFOS, PFOA and GenX, Knappe said. 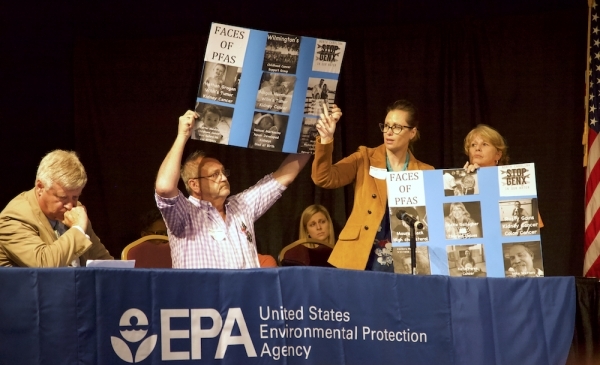 Last August, the EPA held a listening and information session in Fayetteville about GenX and other PFAs. At that meeting, dozens of residents demanded that the EPA and the state environmental officials more aggressively regulate these compounds — and punish polluters, like Chemours. In a press release, the EPA said it relied on the “best available science, including input from independent peer reviewers” to propose the reference dose. The agency also engaged with federal and state partners throughout the development of the draft assessments. “When issued, these toxicity assessments may be used, along with specific exposure and other relevant information to determine, under the appropriate regulations and statutes, if and when it is necessary to take action to address potential risk associated with human exposures to these PFAs chemicals,” the release stated.